Excellent progress on K2 over the weekend with both teams moving well but more bad weather in the forecast including wind chills of -108F!! Four climbers, Abildaev, Aubakirov, Danichkin and Pivtsov, of the The Kazakhstan, Russia and Kyrgyzstan team climbed above the Black Pyramid and left a cache of gear at 7,100-meters over the weekend. This was their high point thus far. They returned to Camp 2 and will return to base camp to wait out degrading weather. As I told you yesterday, we will only risk what we can control. When we saw that the wind was still quite strong at the first camp and that in those conditions, it was impossible to continue equipping more, we decided to return to the Base Camp. It has helped us to prove ourselves and to see how long it takes us. We took our headlamps and went out at night, it took us 7 hours to get to Camp 1. We spent there a few hours at -40 degrees of thermal sensation, and we returned to the Base Camp. In total 16 hours, we are happy of doing it in that a short space of time. 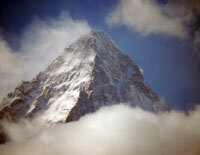 Therefore, it is important to respect the weather until the K2 gives us the chance to go up again. We are in winter and this is how the mountain works, but I wouldn´t change it for anything else. Daniele Nardi, and British Thomas Ballard continue to wait out weather at base camp. They are attempting the Mummery’s Spur. Many people (outside of the United States) do not understand a -108F temperature. Has Trump’s border wall left you all ignorant (or arrogant) of the commonly recognized and understood International Measuring System of Units which includes the unit “celcius” for temperature? I’m sure Alex T is using degrees celcius when he quotes -40 degrees of thermal sensation and I’m sure the rest of the international community (Pakistan, Nepal & Tibet included) reading your reports understand celcius more than your archaic farenheit system. You use meters for elevation, so what then does -108F refer to?